Phaseolus lunatus is the common lima bean of the family Fabaceae. It is a large seed species of bean that is eaten fresh or used dried. The parts of the bean that are eaten are the inside seeds, as the pod is tough and slightly hairy. Lima beans use epigeal germination, where the seed leaves remain on the shoot from the seed and push above ground. 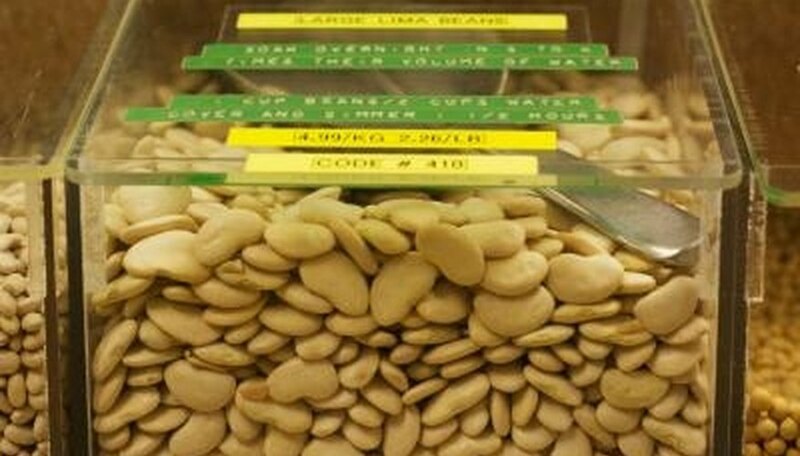 Lima beans prefer dry soil and deep soil and grow a large fibrous root system that makes the plants extremely vigorous. Germination begins when the lima bean is exposed to the right combination of moisture and heat. When the seed is placed in a planting medium or even just kept wet, the seed coat softens and wrinkles and the two halves of the bean seed begin to split. The halves are called cotyledons and are the baby plants' food until it has exhausted the root supplyl. The cotyledons form the first leaves on the lima bean seedling. The plant embryo grows inside the seed and pushes out a bump on the bean. The seed embryo sends out a radicle, which will become the root of the bean seedling. The hypocotyl emerges as part of the future stem and is attached to the cotyledons or seed leaves. The plant is beginning to form the basic parts of a plant. The hypocotyl is responsible for moving the growing tip up through the ground and into the world. The hypocotyl ends in the radicle, which is busy forming root shoots. The radicle and the hypocotyl are topped by the plumule, which will become the first true leaves of the plant. It forms into unifoliate leaves and then secondary and tertiary unifoliate leaves. Meanwhile, the embryo is digesting the seed body and the cotyledons that have emerged from the soil are gathering energy from the sun to continue the growing process. As soon as the plumule has been pushed to the surface and the first true leaves unfurl, the cotyledon or seed leaves wither. The seed leaves are no longer needed as soon as true leaves are available to provide respiration and photosynthesis activities. The true leaves have emerged from the soil, and more branching and leaf formation continues along the hypocotyl. More true leaves develop and bud nodes begin to form on the stem of the plant. Nutrition uptake from the soil is taking place from the radicle, which has grown into a root system. The plant is well on its way to creating fruit. What are the Sunflower Plant Growth Stages?